Genuine White-Rodgers ACM1600 media cabinet. Includes Steel Frame, Access Door and Filter. 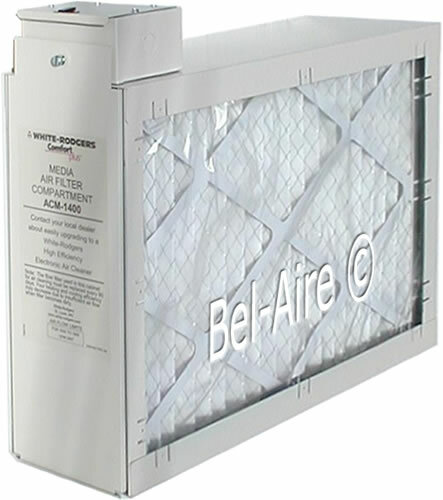 Filter Measures 20 x 21 x 5 inches. This Media Air Cleaner Cabinet mounts on the return-air side of the furnace, cleaning the air with Merv 8 efficiency. This advanced filtration system removes household dust, animal dander and other dirt from the air. 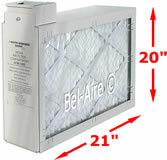 Whole-house Media Air Cleaners are a smart, easy and affordable way to purify the air throughout the home. The ACM Series is a big leap beyond the one inch standard air filter in cleaning the air in your home at up to 55% efficiency. Your health is directly affected by the quality of the air you breath. Comfort Plus air cleaners remove many health harming airborne contaminants. This ACM1600 can be upgraded to the SST1600.